CUPE Ontario and its Aboriginal Council wish to express our heartfelt sorrow and condolences to the family of Colten Boushie, his friends and all Indigenous peoples. The killing of Colten Boushie and the failure to convict the person who killed him is another stain on Canada’s justice system and how it deals with Indigenous peoples. Canada’s justice system does not work for Indigenous peoples. Their representation as police officers, prosecutors, judges, and on juries is almost non-existent in our system. Indigenous culture and values are not represented in Canada’s “rule of law”. The failure of Canada’s justice system is another example of the societal injustices Indigenous peoples face. Residential schools, the 60’s scoop, the failure to investigate missing and murdered aboriginal women and girls, the lack of adequate education funding for Indigenous children, the violation of treaty rights, imprisonment rates, lack of clean water on reserves, and crippling poverty are evidence of Canada’s discriminatory approach to Indigenous peoples. Radical change needs to happen in Canada’s relationship with Indigenous peoples. CUPE Ontario’s Aboriginal Council calls on the government of Canada to reform our justice system so that it reflects the culture and values of Indigenous peoples. We need to work toward the creation of an Indigenous peoples’ justice system and to end the practice of peremptory challenge that was used by the defence in the Colten Boushie trial to exclude Indigenous peoples from the jury resulting in an all-white jury. Changing the jury selection process so that it does not discriminate was an action that Justice Murray Sinclair called for back in 1991. Five years ago, former Justice Frank Iacobucci also recommended that Ontario urge the federal government to end peremptory challenges. It is time for change and CUPE Ontario and the Aboriginal Council will continue to fight for the changes necessary to ensure Indigenous peoples get justice. It’s the end of the Fall term and also the beginning of flu season. All the crunch associated with wrapping up courses and marking/grading at the end of the semester makes us vulnerable to bugs and viruses. Fortunately, our collective agreement allows for a paid sick leave. For Unit 1 it is five paid sick days a term. The odd particularity about our sick leave is that each day of the week is covered only once (e.g., one Monday, one Tuesday, etc.). See article 19 of our collective agreement. In the event you become sick, make sure you let the Chair of your department know as soon as you can, so the department can make arrangements associated with your absence and even find a replacement for you. This means that you do not lose pay while nursing your illness at home, and the replacement fellow worker gets paid – a win-win solution! If you not have scheduled contact hours with students (at the end of the semester or as Marker/Grader), the department shall allow reasonable and sufficient time to complete your marking/grading duties. Our Equity Officer is moving on to a new job. We wish Samantha the best in her new pursuits in the beautiful city of Peterborough! There will be an election to the vacant position of Equity Officer at our November 27th General Members Meeting [GMM]. Any member can run for the position. Please send nominations (you can nominate yourself as well!) and/or inquiries to cupe4207@brocku.ca. You can nominate a member or yourself directly at the GMM. This is an Executive Committee position subject to monthly stipend. All elected positions in our local expire on April 30 each year. General elections into all positions are held at our Annual General Members meeting [AGM] in April (date/location TBD ). Incoming members who have signed their contracts for this Fall may have already noticed the absence of preferred payment schedule check boxes, together with the list of the actual dollar amounts for each pay day. 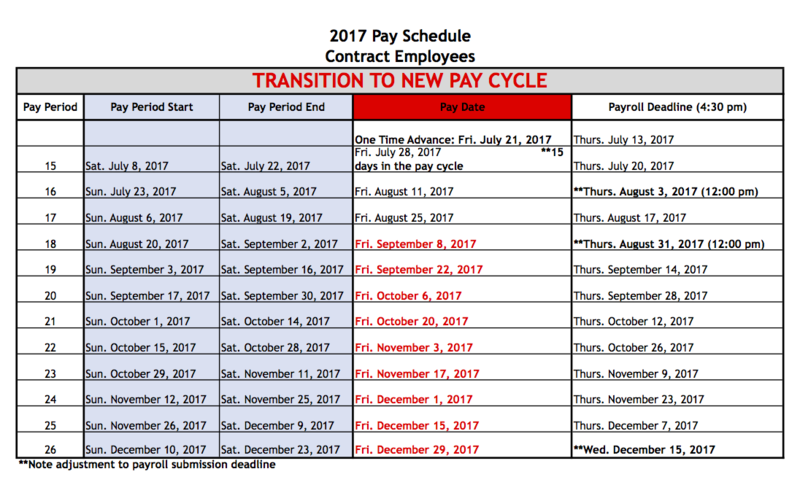 The university has implemented a new pay schedule over the summer — “bi-weekly pay cycle with one week lag“. This means that we get paid one week after the two week pay period by which we have been paid according to the former pay system. You can access your payroll-related information by clicking on “Additional Resources” square LOGIN TO ONEBROCK link on the HR website. Sign in as an employee and once in the Office 365 SharePoint page, click on “Payroll”. Check it out for bargaining updates on Unit 1 and Unit 2. Our Local is challenging the employer with the grievance procedure for failing to pay Unit 1 members statutory holiday pay as outlined in the Employment Standards Act*. Contract employees have the right to this pay.